Margot Kinberg’s third novel set at fictional a Pennsylvania University, Tilton, is the first one which sees her series hero, policeman turned academic Joel Williams, tackling a cold case. The investigation is sparked when skeletal remains are discovered during a construction project taking place on campus. The remains are identified as belonging to a student who disappeared from campus in 1974, though there was no investigation at the time. It was the 70’s after all and Bryan Roades was an adult. He could have just gone off ‘to find himself’. Now however we know different. There is something particularly engaging about the concept of cold cases. Somehow their secrets are even more intriguing than those of present-day cases and they offer an insight over and above a standard whodunit. The exploration of how long-past events can have ripple effects into the present – for victims, relatives, friends and perpetrators – is endlessly fascinating if the number of novels, movies and TV shows which feature this concept are anything to go by. In PAST TENSE we meet several people who are still, in some way, impacted by the events of the past. Bryan’s younger sister has never had any kind of answers about his sudden disappearance from their family life. Bryan was pursuing several students and a professor for a story he was writing for the student newspaper. The things he wanted them to discuss are still, today, painful for them all. And then there’s his lover who was petrified of their relationship being made public. All the people who knew Bryan have some emotions to deal with now that his body has been found, not just his killer and it this element that gives the book its dramatic sensibility and allows readers to connect with the book. Who among us doesn’t have a secret or two they would rather remain unexamined by the prying eyes of the present. Kinberg, as you will know if you have followed her blog Confessions of a Mystery Novelist for any length of time, is at home with the classic whodunit style of crime fiction and that shows here. 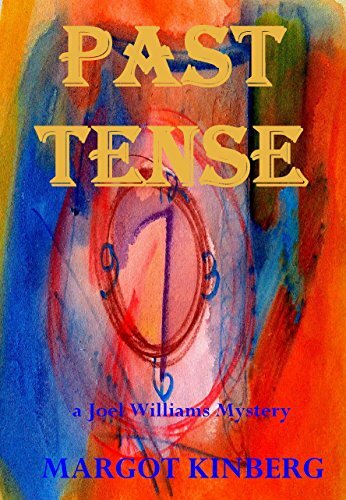 PAST TENSE is in many ways a fine example of the genre, though its particular twist is that the investigation occurs almost in relay with Joel Williams doing his share of the work and two active police officers carrying out those parts of the investigation that it would stretch credibility for an amateur sleuth to do. Even a former professional sleuth. I really like this aspect of the novel because it deals intelligently with the problem often presented by amateur sleuth-led stories. From its gorgeous cover onwards PAST TENSE is a terrific book, especially for those who love a classic mystery. It’s got an interesting suspect pool guaranteed to keep you guessing, engaging investigators, a focus on a fascinating period of history and a solidly constructed plot that is both surprising and satisfying. There’s even a body found by a dog walker (though I suppose technically he’s a dog runner in this instance). Top reading. This entry was posted in book review, Margot Kinberg, USA. Bookmark the permalink. What a nice review. I can’t wait to read Past Tense. It’s a really enjoyable book isn’t it? I’ve just posted on it too. Now that I have posted my review, I can come here and read your review. I only took a peek earlier. Nice overview and comments; I enjoyed the book very much too. And I agree… the cover is lovely.